This proposal is dedicated to those who want to stay in our beachfront Arugam Bay hotel, on the southeast coast of Sri Lanka, to enjoy one of the world's most famous surf locations or simply enjoy the beautiful east coast and the proximity to typical tourist sites in the area, kovils, Buddhist temples, Hindus temples and jungle where you can find elephants, crocodiles and enchanting lagoons. We also offer the possibility to add a surf guide service to the spots of the area: Pottuvil, Okanda, Elephant rock, Peanut farm, Whiskey point, etc..
Arugam Bay is a fishing village on the southeast coast of Sry Lanka, immersed in wilderness, it is not uncommon to meet elephants at the beach while walking to the surf point! The best season for surfing runs from April to October, when the famous right hander point breaks of the area offer endless waves. Surf Pack A: 2 hours of surf + surfboard rental all day + short distance transport 15 minutes (Whiskey point, Elephant Rock, Peanut farm) 45,00€ p.p. 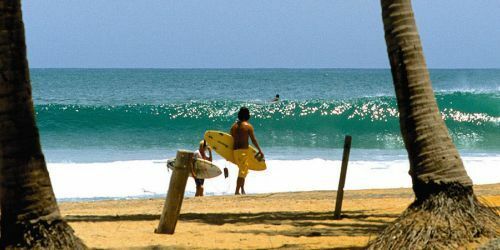 Surf Pack B: 2 hours of surf + short distance transport 15 minutes (Whiskey point, Elephant Rock, Peanut farm) 39,00€ p.p. 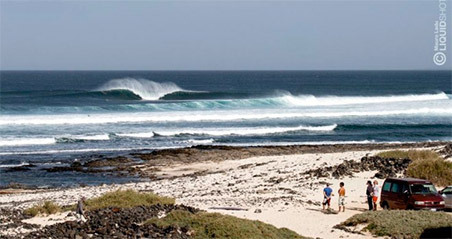 Surf Pack C: 2 hours of surf + surfboard rental all day + long distance transport 45 minutes (Light house, Okanda) 70,00€ p.p. Ayurvedic massage full body 25,00€ p.p. IMPORTANT: Prices may change depending to €/US$ exchange rate. Sri Lanka is easily accessible by international flights to Colombo international airport (CMB), which is about 7 hours drive from our camp. Surfcamp airport shuttle: Upon request, we can offer airport/camp return transfer with private driver. The transfer has an extra charge of 175 euro (per way, up to 5 people, duration about 7 hours per way). Taxy: Reach the camp by taxy is convenient, but the trip is quite long (around 7 hours). Public transport: You can take several buses or the famous coal train, but delays and connections will easily take you more than a day to get to Arugam Bay. Most nationalities need a Visa to travel to Sri Lanka, which is normally free of charge. You can find all the relevant information here: Visa Sri Lanka. We always recommend to check the validity of your passport before traveling (at least 6 months validity from the scheduled return date) and to take various copies of your passport with you, if the original gets lost. There are good hospital facilities, but we recommend traveling with an international travel insurance.